The above tournament, better known by the acronym Datmo 2008 commenced Round 1 this morning concurrently with the 5th AmBank Chess Challenge at the same venue in CitiTel Mid Valley Hotel, Kuala Lumpur. The championship attracts some 38 titled players of 9 Grand Masters (GM) and 3 Woman Grand Masters (WGM) as well as 15 other International Masters (IM) and Woman International Masters (WIM), and 9 other FM/WFM . The Malaysian Chess Federation is pleased to receive strong support with total participations of 112 players. The Malaysians are definitely overwhelmed by the number and strength of foreign players from Singapore, China, Bangladesh, Uzbekistan, Croatia, Philippines, Indonesia, Armenia, Australia, Brunei, Japan,India, Australia New Zealand, Hong Kong and England. This should serve as an invaluable international exposure for the local players and to earn or to improve their ratings. To our top players this should also serve as a hunting ground to strengthen or move up their FIDE titles. In the first round top rated GM Zhang Zhong (Fide 2632) downed our current National Closed runner up Leong Mun Wan. Mas Hafizulhelmi got through the first round with an academic knight bishop end game. That should be a basic warm up for him. A credible performance was put up by Ismail Ahmad who secured a draw with GM Sermek Drazen. 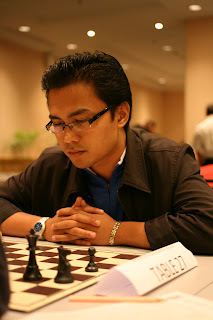 Similarly Abang Zain Azreen Draup scored a fine draw against his higher rated opponent IM Tan Lian-Ann.